Good afternoon everyone! I hope you are enjoying all of the challenges!?! We are only at the half way mark and you still have plenty of time to catch up or join in on the fun! You won't want to miss out :) Remember you have 5 days to complete the challenges and upload your creations to be eligible to win some FANTASTIC prizes! I'm so excited to be hosting a challenge for you today. Since this is a challenge I've decided to challenge myself too! I've never been a fan of scissors as I'm sort of accident prone...lol BUT like I said it's a challenge right? So how about a little paper tole? Not sure what that is? It's when you stamp your image at least three times, cut it out, pop it up with dimensionals. Here I have stamped the bear from Beary Special but only the bear paws are popped three times. The bear and present(from the Beary Special Accessories) has been popped twice. CHALLENGE: Get out your scissors and layer up some fabulous stamped images! You’re not required to use Taylored Expressions images for our challenges. KEYWORD: Upload your creation to your blog or online gallery (or both). 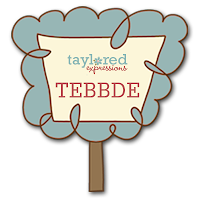 If you’re uploading to online galleries, use the keyword TEBBDE. Then come back to this challenge and leave a comment with a direct link to your creation! In order to be eligible for the prizes, you must leave a comment with a link to your card by midnight PST Wednesday, September 9th. I am very ready!!! Loving these challenges, their making me use things I dont typically do. Love Love LOVE your bear card, Dawn! Oh my gosh, SOOOOOO STINKIN' CUTE!! SO fun Dawn! I played along for the pure fun of it! Your card is just darling!!! Mine did not turn out very good but here it is! Thanks for a great challenge! Here is mine. What a cute card and amazing challenge! I had the chance to play along, I hope you like it. Thanks for hosting such a fun challenge! Here is mine combined with some of the other challenges...the sunflower is POPPED! Loved your sample, thanks for the challenge! Your card is beautiful Dawn!! I love this technique too! Here is my card - I combined a couple of the challenges! Great challenge! Here is my card! this was a fun challenge. I have never tried paper tole before so I was excited to try. It is much easier than I had thought it would be. I am trying it again. I am trying this again. I hope it fixes the problem.